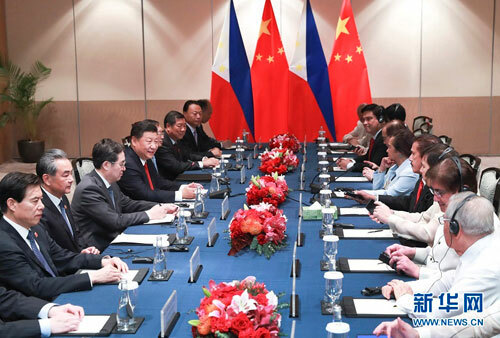 MANILA, Nov. 21,Visiting President Xi Jinping has called on legislative bodies from China and the Philippines to further exchange experience in state governance and push forward multilevel, multiform cooperation for the development of the two nations' bilateral ties. 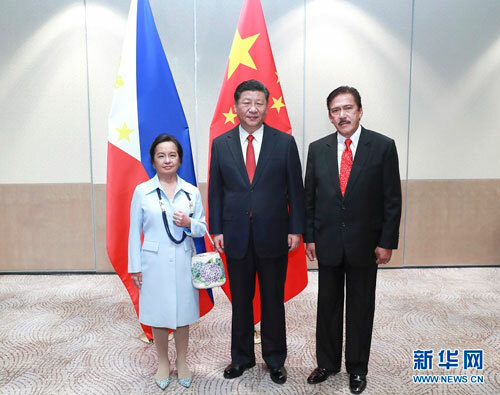 Xi expressed the hope that the Philippines' top legislature will play a bigger role in promoting China-Philippines friendship, during a meeting with the Philippines' House of Representatives Speaker Gloria Macapagal Arroyo and President of the Senate Vicente Sotto III here on Wednesday. Friendly exchanges between legislative bodies of both sides form an important part of the China-Philippines relations, which now stand at a new historic starting point and thus possess broad development prospect, Xi said. In recent years, the China-Philippines relations have displayed new vitality and achieved leapfrog development, bringing benefits to the two peoples as well as encouraging regional peace and stability, according to the president. The upgrade of the China-Philippines relations to comprehensive strategic cooperation had been jointly announced by Xi and his Philippine counterpart Rodrigo Duterte here on Tuesday. "We must continue going on the right path, deepen practical cooperation, consolidate the material basis of the bilateral ties, expand people-to-people exchanges, cement public support, properly handle the South China Sea issue, stick to the right direction for the development of bilateral ties, and make good neighbors and partners that share the prosperity," Xi told Arroyo and Sotto. The president praised them for being good and old friends of the Chinese people and contributing to the China-Philippines friendship for a long time. He also called for more support from the legislative bodies on practical cooperation, especially in areas of education, culture and tourism. For their part, Arroyo and Sotto, while applauding the upgrade of the bilateral ties, both expressed their willingness to step up exchanges with Chinese legislative bodies and deepen practical cooperation in all fields, for the benefits of the two peoples and the building of a community with a shared future for humanity. With all-round cooperation going well and China being one of the most important partners for the Philippines' economic development, the Philippines-China relations are now at the best period in history, said Arroyo and Sotto. The Philippines would like to learn from China's success in achieving rapid economic and social development, push for more cooperation in trade and infrastructure, strengthen people-to-people exchanges and better benefit the two peoples, they added.